Australia’s Northern territory in the remote outback is home to the tourist meccas of Ayers Rock and Kakadu, spectacular scenery, miles of desert and savannah, and a population of 219,800. It covers 1,349,129 square kilometres, or roughly 17.5% of the Australian landmass. This vast area, like the rest of Australia, has a network of weather stations managed by the Bureau of Meteorology (BOM). 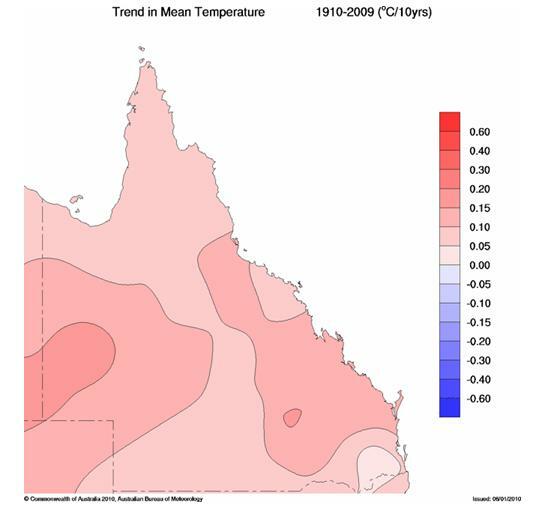 BOM produces climate information for the public and the government. 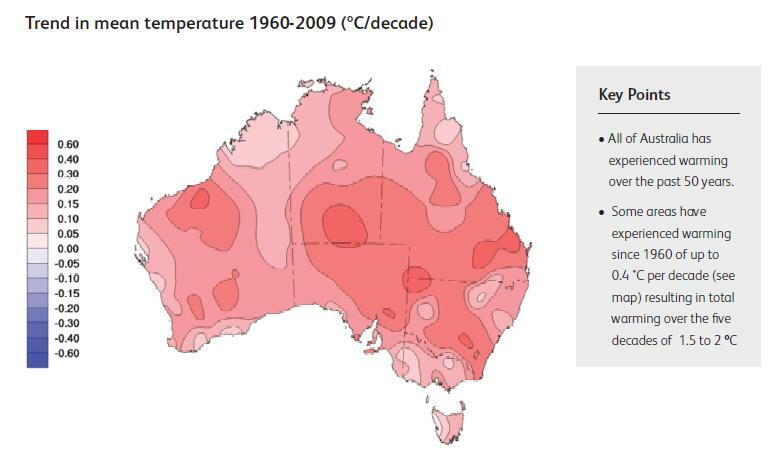 The official climate record is presented as trend maps and time series graphs for Australia as a whole, various regions, and each State and territory. This official record is produced from the High Quality Data Sites- 100 non-urban sites across Australia. 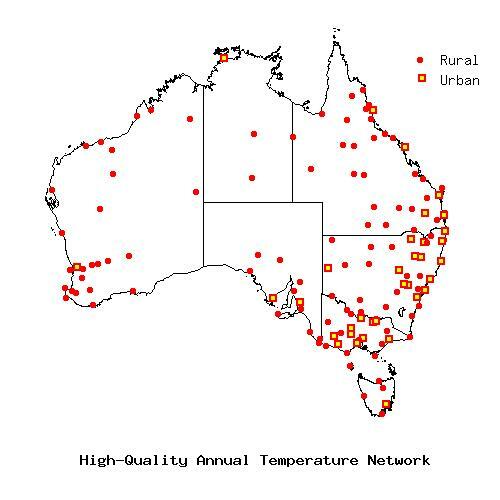 In Queensland, it produces a trend in mean temperatures that is 0.2 degrees Celsius greater than the raw data does. 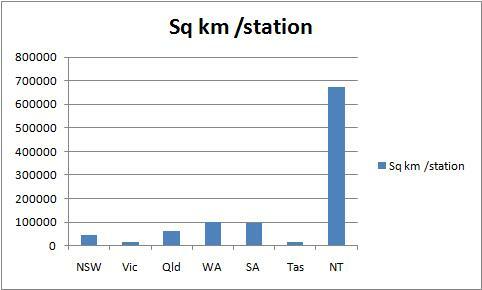 Now, how many HQ stations were used to build the Northern Territory’s climate record? 2. That’s right, TWO. Alice Springs Airport and Tennant Creek Airport. Darwin isn’t used because it is urban. These two climate records, and the thermometers that produce them, are the most powerful in the nation. 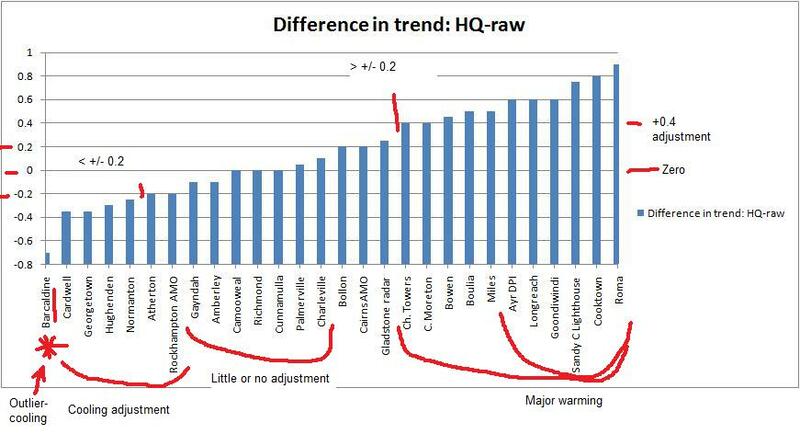 Here’s a graph showing the area of each State per HQ climate site. Note the big red section around Alice Springs! 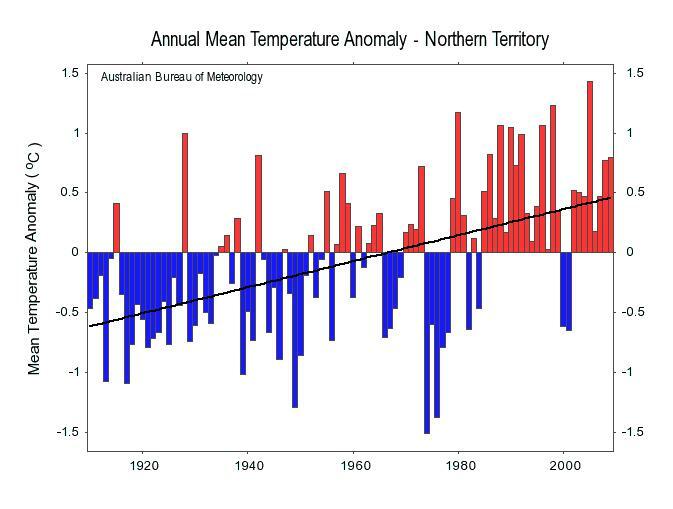 And the time series: The Northern Territory has a warming trend of 1.1 degrees Celsius per 100 years, so a lot depends on those two sites, because as you can see from the table below, the trend has been increased from 0.98 degrees to 1.13 degrees per 100 years. Round all figures to tenths, 1 degree C to 1.1C. No, no other sites were used. 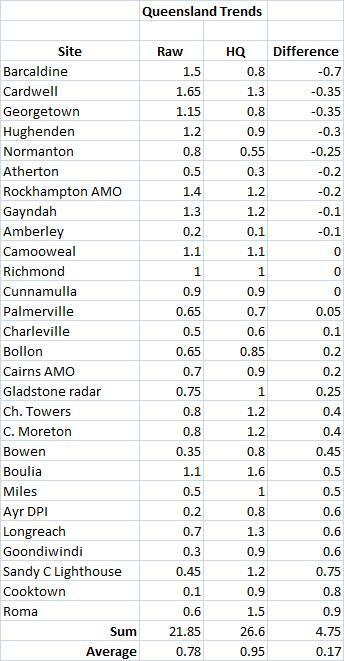 A 10% warming bias- and all due to Alice Springs, as you can see. 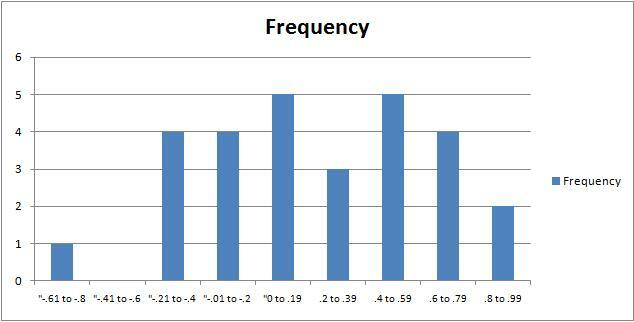 When you look at the individual records, the arbitrary nature of the adjustments becomes apparent. Warming increased from 0.95 to 1.65. No nearby stations have a complete record. Only one (Charlotte Waters) covers the early decades, and it shows cooling. So the adjustment must be based on records from many hundreds of kilometres away- like Tennant Creek, which shows less warming! 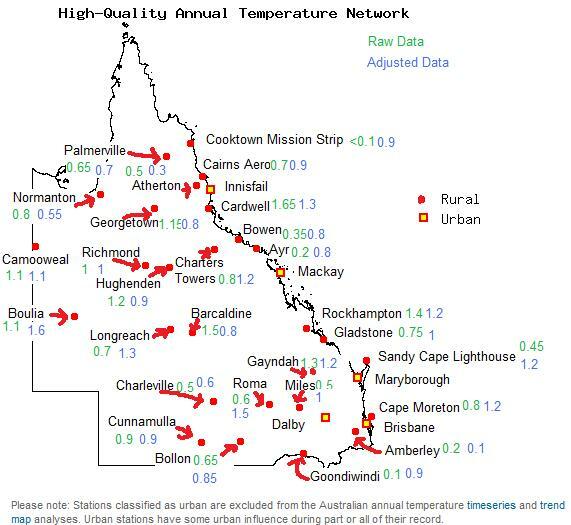 The nearest long term station in Queensland showing similar warming is Boulia (raw trend 1.1 degrees, adjusted to >1.6 degrees!) 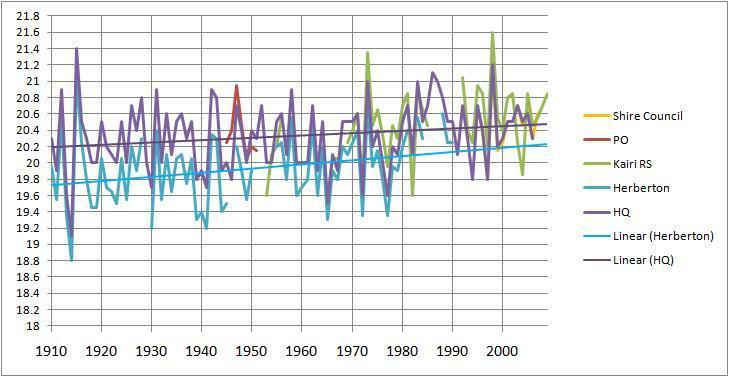 Further south, Oodnadatta has records only from 1941, showing considerable warming since then, but there is no evidence that this warming started in 1910. Therefore, the HQ record for Alice Springs, subjectively and manually adjusted, is arguably highly suspect. 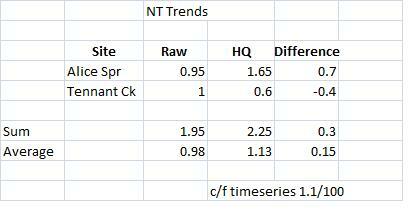 It follows that the time series for the Northern Territory is also incorrect. 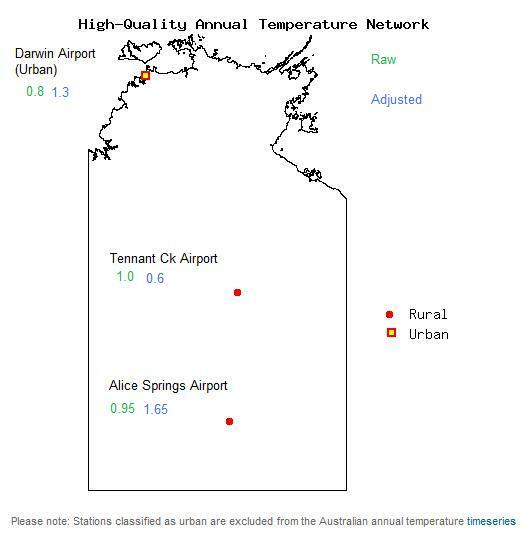 Note the airport shows a warming of about 0.8C- if the trend is extrapolated back to 1910, which is not good practice. From 0.8 to 1.3 degrees per 100 years! There are no long term stations within hundreds of kilometres of Darwin. 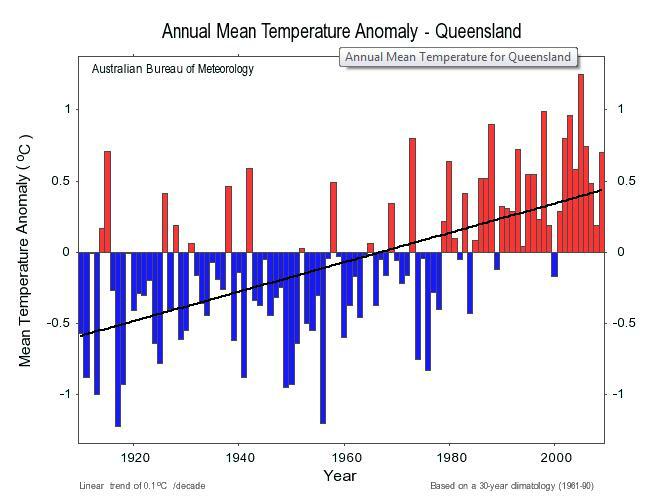 Daly Waters is from 1926, and surprise, does NOT support such a warming trend. Darwin’s trend: 0.5C, and a good mirror of Daly Waters. Note the 1970s dip, common throughout the inland. BOM’s adjustment does not stand up. 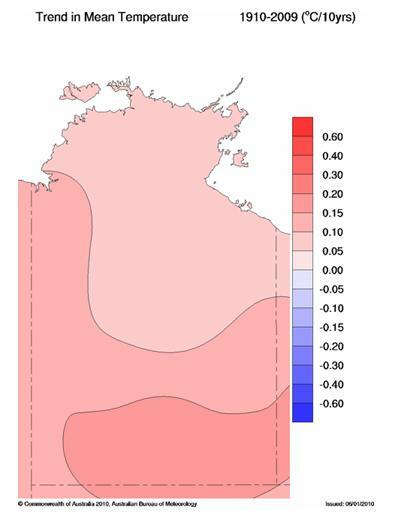 The climate record for the Northern Territory is based on very limited data. Very few stations have long records, much data is missing, and the Trend Maps and Time Series Graphs thus depend on only two sites. Both of them showed about 1 degree of warming, but Alice Springs has been manually adjusted to give extra warming which cannot be justified. Similarly, Darwin’s extra warming (though not used in the record) cannot be justified. You are currently browsing the kenskingdom blog archives for May, 2010.